Pre-wired to accommodate eight separate functions. Each push button is back lit to illuminate each function. 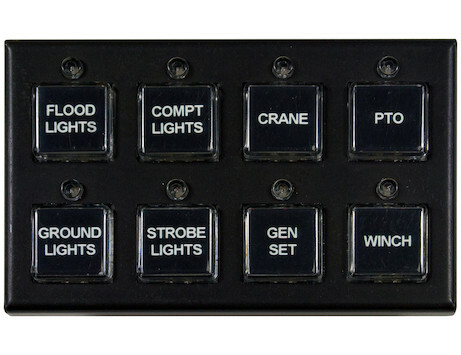 Buyers Products 8 Function Programmable Switch Panel comes pre-wired to control up to 8 functions. Each push button is back lit and accommodates a custom legend (included). The switch panel has an LED status indicator for each switch and is a 15 amp/switch power module.